I was born in 1957 in Ft. Worth, Texas, grew up in Arlington, and attended Texas Tech University (Lubbock) from 1977 to 1980. Received a BS in Park Administration. During college I worked part time in the summers in parks in Texas and Arkansas. In 1984 I landed my first full-time park job at Petit Jean State Park. Now I’m the director of a historic cotton museum in Arkansas. I’ve been working twenty-two years with Arkansas State Parks. My hobbies include canoeing, hiking, Blacksmithing, flint knapping, photography, antique woodworking tools, drawing and other art, pottery, carpentry, bicycling, antique engines, brewing and distilling, jewelry and Native American crafts. I have been a professional jeweler. I set stones, sized rings, repaired every malady to jewelry one can imagine and made some custom pieces. Professional and other affiliations include: Institute of Museum & Library Services Museums for America Grant Review Panel; Life member of the Arkansas Archeological Society; Member of the American Rock Art Research Assn & Eastern States Rock Art Research Association; Member of the Arkansas Museums Association; and a Member of the Arkansas Early Reenactors Association. My greatest accomplishment? I implemented a site protection plan that saved a major rock art site in Arkansas from destruction. We’ve removed graffiti, made improvements in site interpretation, trail improvements and a ton of other stuff that has the site looking like it did a thousand years ago. I started writing stories in the fall of 2004. Though I have little writing experience, I have a lot of experience with life. There is much to write about. 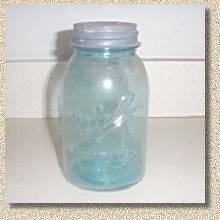 Remember Mason Jars? They are named "Mason" after John L. Mason, the inventor of the first common home canning jar. The half-pint jars are usually used for jellies or small spreads. Ben Henry writes of childhood memories, growing up and family love. Recollections of a time passed. Things were different back then. Ben tells a complete story in this flash fiction piece, 1,000 words that say more than many novels. I love nostalgia. How about you? When I was a boy, I always wondered why Momma put up so many jars of fruit. I liked her jam and jelly, but what was it that made her want to can so much of it? She made huge batches at a time, maybe two or three bushels of peaches or whatever fruit was on for harvest. Dad would trudge to the commissary for her after the last cultivating was done, about the time summer hit hard. She couldn’t wait any time the fruit was on. First it would be blackberries, then plums, and then peaches. In a good year, she might add figs or make watermelon rind preserves. We didn’t have any money late in the summer when the blackberries would come in. We were sharecroppers and no one ever saw any money until the cotton was picked. Daddy would tell Mr. Abraham to put the sugar, the pectin and the jar seals on his account, and brought home Momma her canning supplies, no questions asked. I think Daddy just had a taste for jam and didn’t think it would be wise to stand in Momma’s way by delaying her even a day. Dad and I got up before light when there was work to be done, like hitching the mules or getting ready to dust the cotton for weevils, but Momma was already in the kitchen, boiling jars and cooking fruit. It was a heavenly odor that filled the house and made the biscuits smell ten times better. Toward the end of the summer, Ma had done all that she could do towards putting things up in jars, except for tomatoes, okra and a few other garden vegetables. I don’t know where in the world she ever got all of the jars because I never remember Daddy buying her any. She must have got them from admirers of her glass encased cuisine, because Momma never let a jar go without a solemn oath by the recipient to return it when it was empty. I think the only exceptions were when she sent some to a family in mourning or what she might give to a beggar at the door. I used to think about her preserves when we were fighting the Germans and I was lying in a cold foxhole, wondering if I was going to die. I thought about a lot of things during the worst times; girls, spring, sweat dripping till my shirt was wet, how I hated picking cotton, and home. Once I got back from the war, I didn’t have much more taste for sharecropping. Dad said the mules were gone and Mr. Fitch had him on a tractor anyway. Daddy had always been handy with engines and he and tractors made good partners. Daddy was lucky because for every tractor, nine other people weren’t needed much but for picking cotton. All anyone who needed pickers had to do was drive to Ruston with a truck and fill it up with laborers. Daddy said the Gadets and the Baughs had gone to Chicago during the war to work at the mills. Mr. Robinson and the Moreaus had gone to Detroit to work in the factories. Half a dozen other families had gone for factory work and left their little shacks vacant. I heard about the GI Bill and decided that I should go to college. Daddy and Momma didn’t have the money to send me, but the loan paid for everything I needed. I went to Louisiana State University in Baton Rouge and worked in the library when I wasn’t in class. Every fall I would get a package in the mail filled with jars of fruit. On each jar there was a label, “bring home the jars.” I never said a word to Momma about it, even though I managed to bring home every jar ever given to me, even from France. Every time I went home for Christmas, Easter, or some holiday, Momma would send me back to school with jars of preserves in my trunk. It was a constant chain of full-to-empty jars surrounding my every trip. As she and Daddy got older, the choices became more limited. It became one or two things to put up a year. She didn’t have all the other women to help her find a blackberry patch, or a fig tree that was really putting on fruit, or a peach orchard that needed picking. Most of the old sharecropper houses were empty, but Daddy still hung on working on the diesel engines at the cotton gin, or repairing the rice-well pumps. He made enough money to buy his own place, being one of the few diesel mechanics around the town. I took a job with the newspaper in Lafayette and visited home when I could. Years went by, and without fail, Momma would send me home with some delight in a fruit jar. Eventually Daddy died, but that didn’t stop Ma from living life or putting up fruit in jars. When Momma died, we cleaned out her house and parted with what few things she had. In her cabinet. There were half a dozen jars of fruit, mostly plum preserves. Yesterday was one year after Momma died. I went to their graves, remembering her and Daddy and their ways of doing things. I had an empty jar with me, filled with flowers. I knew what I had to do.